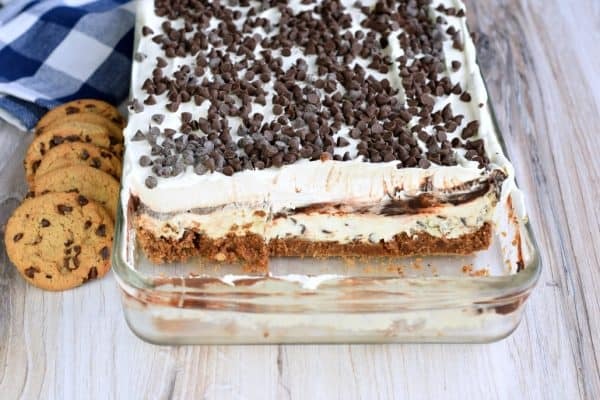 No Bake Chocolate Chip Cookie Lasagna – layers of chocolate chip cookies, creamy cheesecake, fudge pudding, and whipped cream! Perfect for any party! 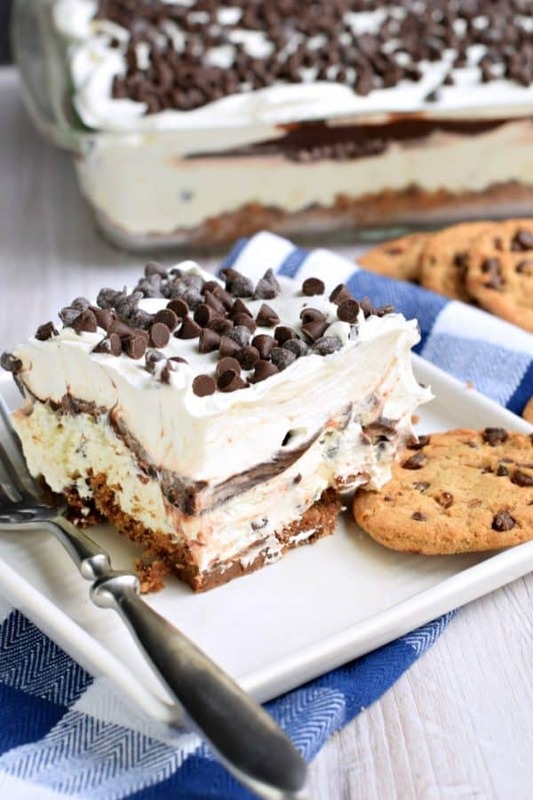 Who can resist layers of cookie, pudding, and whipped cream? 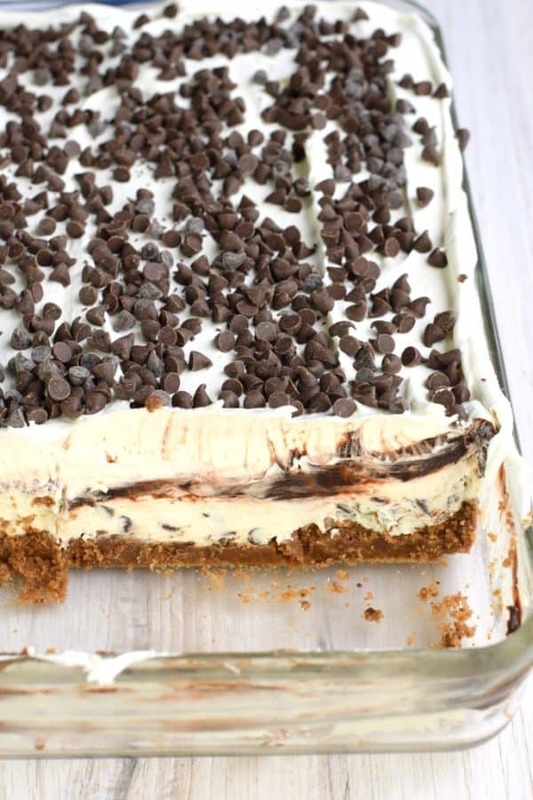 This delicious no bake treat is a must make! It’s perfect for a weekday dessert, and impressive enough to share with friends! I remember YEARS AGO having something similar at Olive Garden, anyone else remember this or am I losing my mind? Let’s talk about how easy this no bake treat is to make! Start by deciding what kind of cookies to use in the first layer. Some people opt for an Oreo crust, but I personally think they’re overused in cookie crusts. I chose Chips Ahoy (chocolate chip cookies). Get any crunchy cookie variety and pulse it a few times in a food processor until fine crumbs. Or use a ziploc bag and crush with a rolling pin! Add melted butter to the cookie crumbs and pour into the bottom of a 13×9 baking dish. Using the palm of your hand or the bottom of a cup, firmly press the crumbs into the bottom of the dish. Set aside. The next layer is a rich, decadent cream cheese layer. In a large bowl, beat softened cream cheese, powdered sugar, and vanilla extract until smooth and creamy. Fold Cool Whip in cream cheese mixture until blended. Fold in mini chocolate chips. Pour over crust. Using an offset spatula, spread the mixture evenly over the crust layer. In a large bowl add two packages of INSTANT chocolate pudding mix. Make sure you purchase the instant variety or this won’t set up properly. Whisk in milk. You’ll use less milk than the box says because you want this layer extra thick and fudgy. Once the pudding mix is well blended, spread the pudding over cheesecake layer. Add remaining Cool Whip to the top of the chocolate lasagna. Sprinkle with more mini chocolate chips and refrigerate for 3 hours or overnight. Slice and serve. Store in refrigerator for up to 5 days. ENJOY. 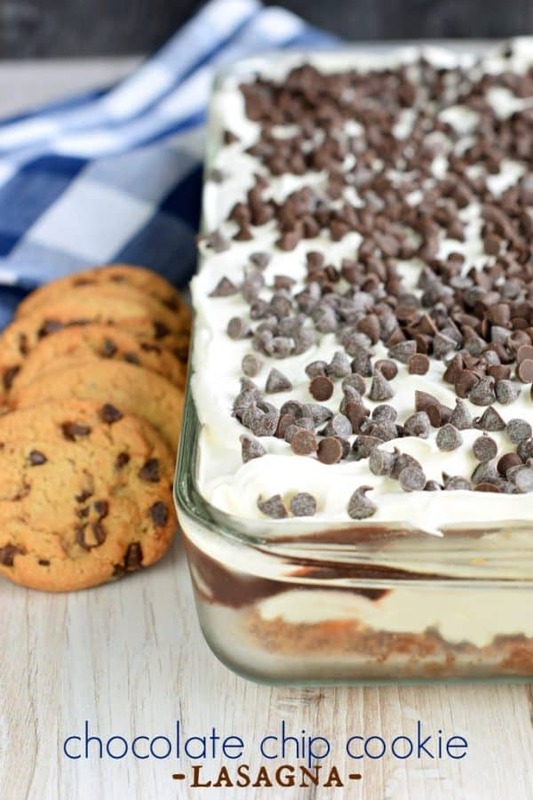 If you’re looking for a portable dessert for you next bbq or potluck this Chocolate Chip Cookie Lasagna is perfect. 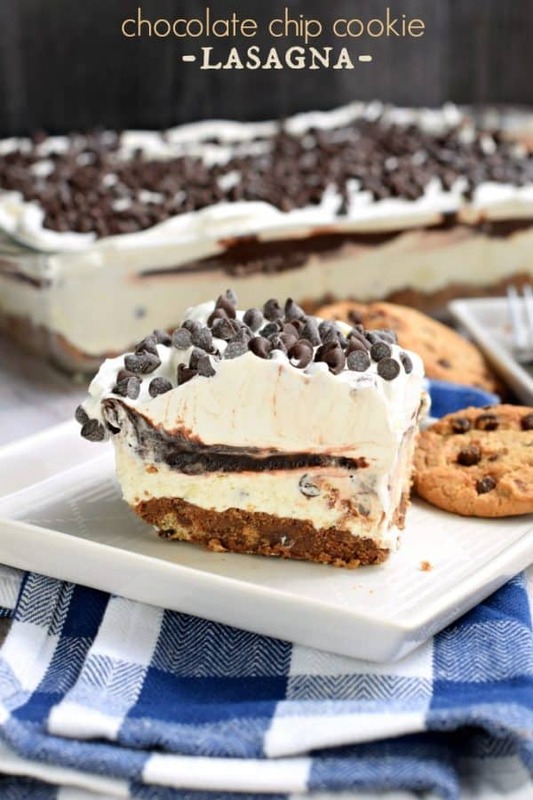 This easy, no bake Chocolate Chip Cookie Cheesecake recipe is the perfect summer treat. 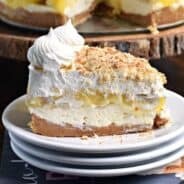 Cookie crust with creamy cheesecake filling, so decadent and delicious! Craving chocolate chip cookies after reading this recipe? Be sure to try out my Perfect Chocolate Chip Cookie recipe! 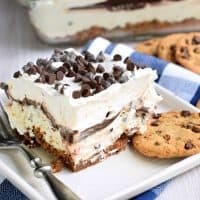 No Bake Chocolate Chip Cookie Lasagna - layers of chocolate chip cookies, creamy cheesecake, fudge pudding, and whipped cream! Perfect for any party! For the crust layer, pulse cookies in a food processor until fine crumbs. Or use a ziploc bag and crush with a rolling pin! Add melted butter to the cookie crumbs and pour into the bottom of a 13x9 baking dish. In a large bowl, beat softened cream cheese, powdered sugar, and vanilla extract until smooth and creamy. Fold Cool Whip in cream cheese mixture until blended. Fold in mini chocolate chips. In a large bowl add two packages of INSTANT chocolate pudding mix. Make sure you purchase the instant variety or this won't set up properly. Whisk in milk. You'll use less milk than the box says because you want this layer extra thick and fudgy. This was absolutely delicious, one of the best no-bake desserts I’ve ever had! I’m always asked for the recipe when I bring this to a potluck!! BIG hit! 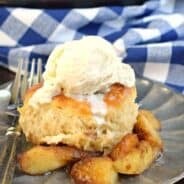 This is probably our favorite dessert ever in this house! 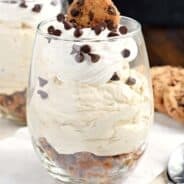 Oh my goodness, this is hands down the perfect dessert!! My family would LOVE it!. This is the best no bake dessert! It disappeared in no time at all!!! This looks so amazing. YUM!!! Thank you for the recipe, it was a hit!